The royal necropolis of Dahshur belongs to two periods of ancient Egyptian history, the 4th and the 12th dynasty. It is located in the desert on the west bank of the Nile, about 40 km south of Cairo. Dahshur formed part of the extensive necropolis of ancient Memphis during the Old Kingdom. It was a main breeding ground for the pyramid age. 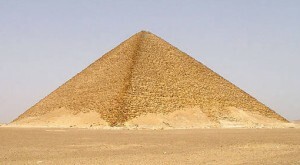 So, we find several pyramids here, including two unique ones: the Bent Pyramid and its close neighbour the Red Pyramid. Both pyramids were built by the pharaoh Sneferu, father of Khufu. The Bent Pyramid was built out of limestone, which was quarried locally. The casing was of polished Turah limestone. The casing blocks are very stable and very difficult to remove because they slope inwards. The base of the pyramid is 188.6 m and it is 105 m high. Because of the bend in construction, the original angle would have made it 128.5 m high. The Bent Pyramid is unique for two reasons. The first is the angle change, which gave this pyramid its name. The building of this pyramid began at an angel of 52 degrees and midway through its construction this angle was changed to the safer angel of 43 degrees. 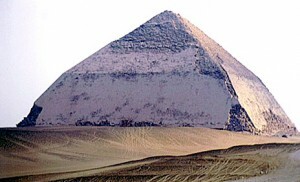 There are several theories about how this pyramid got its shape, such as a design error or cost cutting. Whatever the reason was, the pyramid is for such an early structure massive. The second reason is that is has two entrances. The first entrance we find in the middle of the northern side, about 12 m above the ground, which leads tot the upper chamber. The second entrance is on the western side, just above the ground and leads to the lower chamber. The floors of both chambers were built 4 m deep with small stone blocks. The Bent Pyramid has also a small satellite pyramid, which is 32 m high. This satellite pyramid gave shelter to the life force of the deceased pharaoh and could by this continuing living in this world. On the eastern side of the Bent Pyramid there is a small ceremonial chapel. The Red Pyramid is the world’s first true smooth-sided pyramid and actually the third largest pyramid in Egypt after the Great Pyramids of Khufu and Khafre at Giza. It is called the ‘Red Pyramid’ because of the colour its stones reflect at sunset. The Red Pyramid is 105 m high and was completely built at the angle of 43 degrees. Ancient graffiti indicates it took ten years and seven months to build. 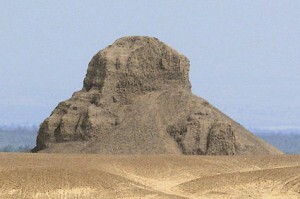 It is the only pyramid open to the public in Dahshur. The entrance is quite high up from the ground. You have to climb 125 steps, before getting access to a 63 m slanting corridor. The passage itself measures about 91cm in height and 1.23 m in width. This corridor leads downwards at an angle of 27 degrees to three interior chambers: two antechambers with 12 m high corbelled vaults and a 15 m high burial chamber with a corbelled ceiling. These three chambers are modest and impressive at the same time. About a mile from the Bent Pyramid we find the Black Pyramid or the Pyramid of Amenemhat 3. It is one of the three collapsed pyramids at Dahshur and the most remarkable one. Originally, this pyramid was 80 m tall, with sides 102 m long, but as a mud brick pyramid lined with limestone, it has deteriorated badly. The polished granite capstone is on display in the main hall of the National Egyptian Museum in Cairo.